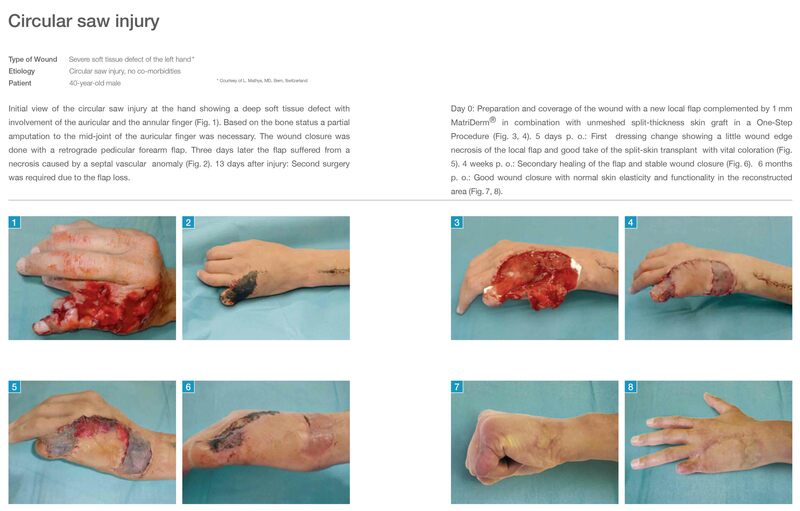 The use of MatriDerm® and skin grafting in post-traumatic wounds. http://www.ncbi.nlm.nih.gov/pubmed/21564554 Int Wound J. 2011 Aug;8(4):400-5. doi: 10.1111/j.1742-481X.2011.00806.x. Epub 2011 May 12. Cervelli V1, Brinci L, Spallone D, Tati E, Palla L, Lucarini L, De Angelis B. The aim of this study was to prove the effectiveness of MatriDerm(®) combined with skin grafting versus skin grafting alone in post-traumatic wounds treatment. At the Department of Plastic and Reconstructive Surgery of the University of Rome Tor Vergata, we treated 60 patients: 30 patients with dermal substitutes (MatriDerm(®)) combined with autologous skin graft and 30 with skin graft alone. Two weeks after the first treatment, 95% of wounds treated with MatriDerm(®) and skin graft showed a re-epithelisation, whereas it was 75-80% in the control group. We used the Manchester Scar Scale (MSS) and patient’s self-estimation scale to assess the outcomes. Mann-Whitney U test was performed for the five items of the MSS and the results were combined to those of patient’s self-estimation scale and the re-epithelialisation percentage to test the significance between the two groups. These data confirm the evidence of the clinical use of MatriDerm(®) technology in the healing of soft tissue wounds and prove the effectiveness of combining MatriDerm(®) and skin grafting for the first time. Furthermore, we observed a percentage reduction of wound contraction and in the same time an improvement of elasticity, quality of scars tissue and dermal architecture. Retrospective analysis of 56 soft tissue defects treated with one-stage reconstruction using dermal skin substitutes. https://www.ncbi.nlm.nih.gov/pubmed/27240066 J Dtsch Dermatol Ges. 2016 Jun;14(6):595-601. doi: 10.1111/ddg.12874. Gümbel D1,2, Ackerl M2, Napp M1, Daeschlein G3, Spranger N2, Stope MB4, Ekkernkamp A1,2, Matthes G1,2. The closure of wounds associated with soft tissue defects is surgically challenging, frequently requiring extensive plastic surgery and free flaps. The combination of dermal skin substitutes and split-thickness skin grafting is an innovative method used to cover such wounds. We incorporated this technique into the standard therapeutic armamentarium for complex injuries to the extremities. Clinical results of 56 patients thus treated are presented. In 44 (78.6 %) cases, the method described was used for defects on the lower extremities, including seven (12.5 %) individuals undergoing amputation stump coverage. Twelve (21.4 %) defects were located on the upper extremities. In two (3.6 %) cases, Matriderm(®) matrix was used to protect nerves from adjacent surgical implants. In 41 (73.2 %) patients, the graft healed without any complication. 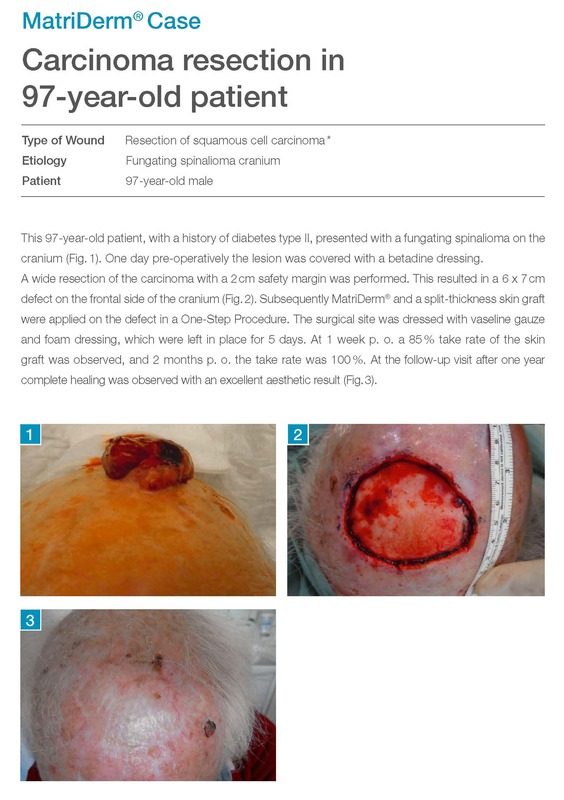 Fifteen (26.8 %) patients displayed impaired wound healing following defect closure and were subsequently managed conservatively. One patient (1.8 %) showed graft failure, leading to revision surgery. None of the patients required extensive plastic surgery. In cases where plastic surgery is unavailable or undesirable, the use of dermal skin substitutes in combination with split-thickness skin grafting represents a promising alternative for covering wounds associated with soft tissue defects. http://www.ncbi.nlm.nih.gov/pubmed/23410720 Ann Chir Plast Esthet. 2013 Jun;58(3):235-42. doi: 10.1016/j.anplas.2013.01.001. Epub 2013 Feb 11. Dermal substitute are used for soft-tissue defect for their functional and aesthetic advantages. Matriderm® 1mm, single layer dermal matrix, composed of collagen and elastin covered by a split thickness skin graft simultaneously to its application, has been used most often in burned surgery. This prospective series evaluates the interest of this recent dermal matrix in reconstructive surgery. Twenty-eight patients have been treated with the substitute in our department for reconstructive surgery indication between November 2008 and May 2012. Indications were tissue losses treatment after limb or trunk sarcoma resection, melanoma, extended baso- or spinocellular carcinoma, palmoplantar keratodermy, burn sequels, or traumatic tissue losses. Indications were preferentially deep tissue losses, functional areas and the face. Mean treated area has been 82.4 cm(2) (10 to 600 cm(2)). Mean taken rate has been 87±19% of the area and mean day of discharge has been 4.8 days and the mean cost per patient 906.5 euros. Negative wound therapy, until D3, was used 6 times. Three patients treated for limb sarcoma had radiotherapy performed on the grafted area. Aesthetic and functional results have been encouraging. Matriderm® 1mm, dermal substitute commonly used in acute burn treatment can be indicated in reconstructive surgery. This series show that it permits to obtain a good graft taken rate, a quick healing with a satisfying aesthetic and functional results and permit an early discharge. However, its indications are limited by its cost. Artificial dermis (Matriderm®) followed by skin graft as an option in dermatofibrosarcoma protuberans with complete circumferential and peripheral deep margin assessment. https://www.ncbi.nlm.nih.gov/pubmed/24102765 DOI:10.1111/iwj.12157 Int Wound J. 2015 Oct;12(5):545-7. doi: 10.1111/iwj.12157. Epub 2013 Sep 19. Bertolli E1, Campagnari M1, Molina AS1, Macedo MP2, Pinto CA2, Cunha IW2, Duprat Neto JP1. Dermatofibrosarcoma protuberans (DFSP) is a locally invasive neoplasia with a pattern of infiltrative growth that leads to extended resections. To avoid unnecessary resections and spare tissues, its treatment requires an adequate assessment of the margins. 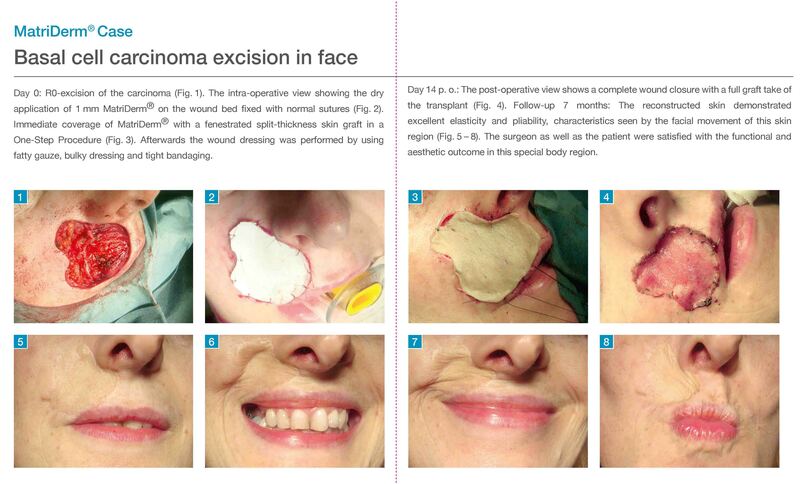 We present a case where artificial dermis (Matriderm®) was used followed by skin graft for reconstruction. We present a 50-year-old woman with a DFSP in the occipital region. She was referred to us after a first surgery with positive margins. A wide local excision with a 2-cm margin was performed and periosteal tissue was also removed, which led to exposure of the skull. Matriderm was placed on the bone surface and dressings were changed every other day. Meanwhile, margins were evaluated by the complete circumferential and peripheral deep margin assessment (CCPDMA) and were positive for DFSP in the superior margin. After 4 weeks the area was completely covered by granulation tissue and a new resection followed by reconstruction with a skin graft was performed. With regard to the difficulties in the margin assessment in DFSP, we present artificial dermis (Matriderm) as an option for reconstructive surgery in these patients, especially when a skin graft cannot be performed as a first option. This is the first case reported in the literature where Matriderm was used in DFSP. We believe that this could become an interesting option in selected patients who will need large resections, especially when a skin graft cannot be performed as a first option. The Capacity of 2 mm MatridermⓇ as a Dermal Substitute in Single Stage Skin Resurfacing. MatridermⓇ is a highly porous dermal substitute consisting of a collagen matrix (collagen type I, III, and V) cross-linked to an elastin hydrolysate. The 1 mm thickness MatridermⓇ is used in a one-stage procedure. On the other hand, 2 mm thickness MatridermⓇ has been used in two- stage procedures in combination with split thickness skin grafts (STSG) for reconstruction as dermal substitute. To the best our knowledge, there is no case that reports the single stage procedure with 2 mm thickness MatridermⓇ. There are many expected advantages if a two-stage surgery could be performed by one-stage procedure as long as the result is guaranteed. The purpose of this study is to present capacity of 2 mm thickness MatridermⓇ as a dermal substitute in sin-gle stage skin grafting by the successful results of six cases. We performed this one-stage procedure in five pa-tients instead of soft tissue reconstruction. 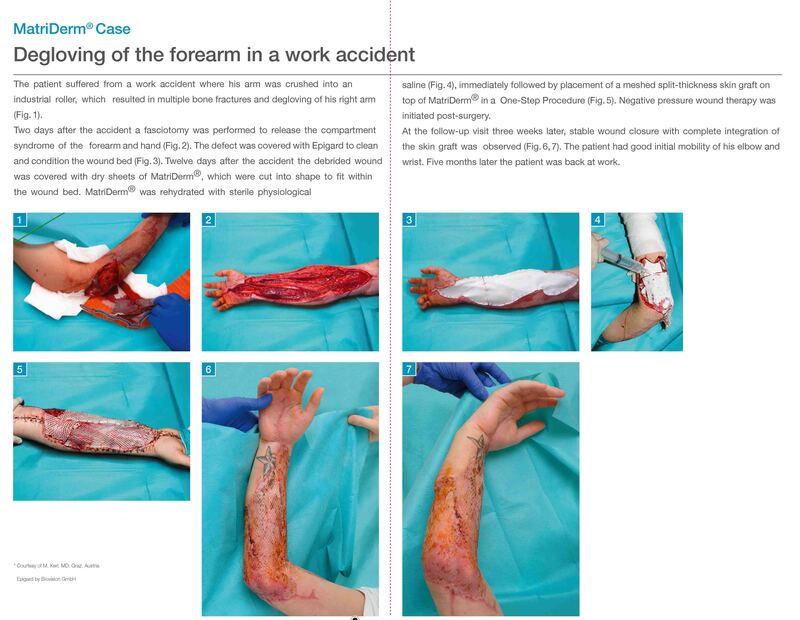 Those patients were required soft tissue reconstruction after trauma injuries or radial forearm harvest as a donor site in the period be-tween 2011 and 2012. Five Patients were treated with a com-bination of STSG and 2 mm thickness MatridermⓇ solely. 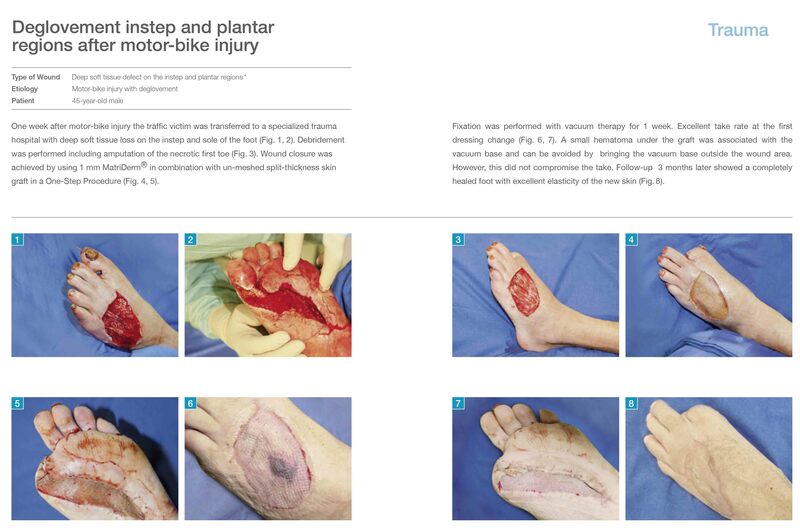 Three out of five patients who were injured by trauma got transplanted splint thickness skin that were range from 4/1000∼8/1000 inches (Table 1). Patients’ data were ana-lyzed retrospectively by chart review and patients interviews. Each patient’s chart was reviewed for age, gender, type of in-jury, complications, final outcome and successful rates. The patient group consisted of 4 men and 1 woman between ages of 5 and 70. The clinical results of these five treated patients concerning skin-quality and coverage of ex-posed soft tissue were very good. Using 2 mm thickness MatridermⓇ the wound could gain more dermal substitute compare to 1 mm thickness MatridermⓇ. MatridermⓇ is a single-use three-dimensional matrix composed of native, structurally intact collagen fibrils and elastin for supporting dermal regeneration. In this study five patients with trauma injuries or radial forearm harvest as a donor site were treated with 2 mm thickness MatridermⓇ as a dermal substitute and STSG as a single-stage procedure to cover exposed structures. Compare to 1 mm MatridermⓇ, 2 mm thickness MatridermⓇ provide more dermal collagen and enhance skin-elastisity. Achieving single stage STSG with 2 mm thickness MatridermⓇ, patient’s hospital days were reduced in half and infection chances were also de-creased. In conclusion, single skin grafting with 2 mm thickness MatridermⓇ is feasible and it is time-effient and cost effective procedure. Crush Trauma by School bus.